The origin of violence – where to now? An increase in domestic violence in the wake of a high profile sporting fixture is not a new phenomenon. A study of the 2010 World Cup found that win or lose, domestic violence spiked after England matches. Alcohol’s contribution to domestic violence is similarly well acknowledged and understood. It is involved in more than 50 per cent of all recorded incidents. Michael Livingston, Deputy Director at the Centre for Alcohol Policy Research is aware of those linkages as he sifts through data from the Bureau of Crime Statistics. He examined six years of data from 2012 to 2017, looking not only at the three Origin Wednesdays each year, but the Wednesday’s on either side; 54 dates in total. In the hours from 6pm on game night to 6am the following morning, assaults rise a staggering 71% and domestic assaults rise over 40%. There is no statistically significant change in the weeks either side of Origin night. He is shocked by the findings. Queensland doesn’t collect data or make it available in the same robust fashion as New South Wales. Dr Livingston, turns instead to his home, Victoria, a State without the same passionate interest in State of Origin to see what was happening on those dates. Dr Livingston is quick to make clear that the data doesn’t speak to the other factors at play that are driving the spike in violence on Origin night beyond the very obvious and very real connection to the game. Dr Melanie Pescud, Research Manager at the Foundation for Alcohol Research and Education (FARE) is less cautious. The Queensland Maroons and New South Wales Blues have been going toe-to-toe since the 1980’s. It’s marketed as Australia’s greatest rivalry. A brutal bloodied body contact sport at the best of times, the violence is celebrated and elevated in State of Origin, as two warring states put everything on the line in the name of state pride. As the NRL’s current marketing proudly declares, “Nothing hits you like origin”. It’s an unfortunate and embarrassing tagline in light of the troubling statistics. If there’s one thing marketed more heavily than the violence, it would be alcohol. FARE Chief Executive Michael Thorn says of all the major Australian sporting contests dripping with excessive alcohol sponsorship, it is Origin that is the most egregious. Mr Thorn stresses that none of this, of course, excuses men who commit acts of violence against women and children. Dr Pescud says that once we acknowledge and accept that other factors can contribute to and exacerbate domestic violence, then we can look at what action can be taken to address the problem in the short term rather than waiting for generational change. Mr Thorn says the NRL cannot be allowed to turn its back on this data. 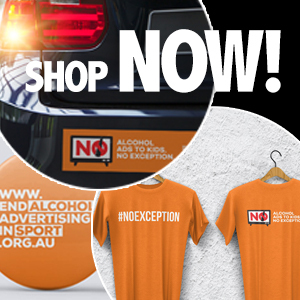 “Knowing as we do the involvement of alcohol in domestic violence, and seeing how the NRL chooses both to celebrate State of Origin violence and at the same time heavily promote and link alcohol to the game, there is no doubt in mind that the NRL is culpable. In the same way that alcohol does not give perpetrators of domestic violence an excuse, nor can the NRL turn on its back on these findings. In the hours during and after the players do battle in State of Origin, rates of domestic violence in New South Wales surge upwards. As long as the NRL clings to its alcohol sponsorship, it will be pouring petrol on a fire and fanning the flames. Women and children of New South Wales deserve better from a national sporting code. The sooner there is a complete ban on alcohol promotion just as there is for tobacco, the better.